Please adhere to the speed limit of 5 mph in the park. Your guests and visitors are to follow the same rules and they are your responsibility. Children of any age are not allowed to hang around the building nor allowed to ride bikes or other child toys, with or without supervision, near the office building for safety reasons. All visitors must register at the office. 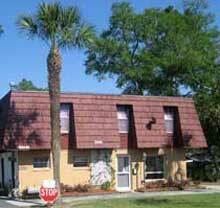 All overnight guests will be charged a fee of $3.00 a day, $15.00 a week or $25.00 A month. The registered camper is responsible for the guests’ actions. Quiet time is 9:00 pm. Please be considerate of your neighbors at all times. Working on cars or trailers is not allowed in the campground. Watering gardens or flowers and washing cars or trailers is prohibited unless you get permission from the owners. Please refrain from driving or walking through sites whether empty or occupied. Privacy is important. During office hours we will gladly take messages for you. Please advise your callers. We will tack your phone message on the message board outside the back door of the office. Please check your mailboxes frequently for memos from the management and mail. This is a private facility and the management reserves the right to modify or change rules from time to time and to eject anyone from the pool or grounds for failure to follow the rules. This is a drug-free campground and we intend to keep it that way. Pool hours are from 10:00 am until dusk. Registered campers only may use the pool. Any child who is not potty trained and still in diapers is not allowed in the pool. No diving or unnecessary jumping. No splashing or generally annoying behavior allowed. Swim suits are required. No street clothes allowed. No beverages or food are allowed inside the fence. Please sign pool rules in the office before entering pool. 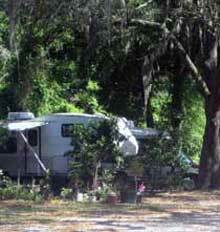 Pets must be inside camper when you are not at home, for their safety and out of consideration for your neighbors. Pets are to be walked on a leash in the designated pet area, or on your own lot. Pet waste must be scooped, bagged, and put in the garbage. Pets are not allowed in the restrooms, laundry or pool area. Weekly & monthly campers are responsible for keeping their sites neat and orderly. No clothes lines are allowed between trees or trailers. 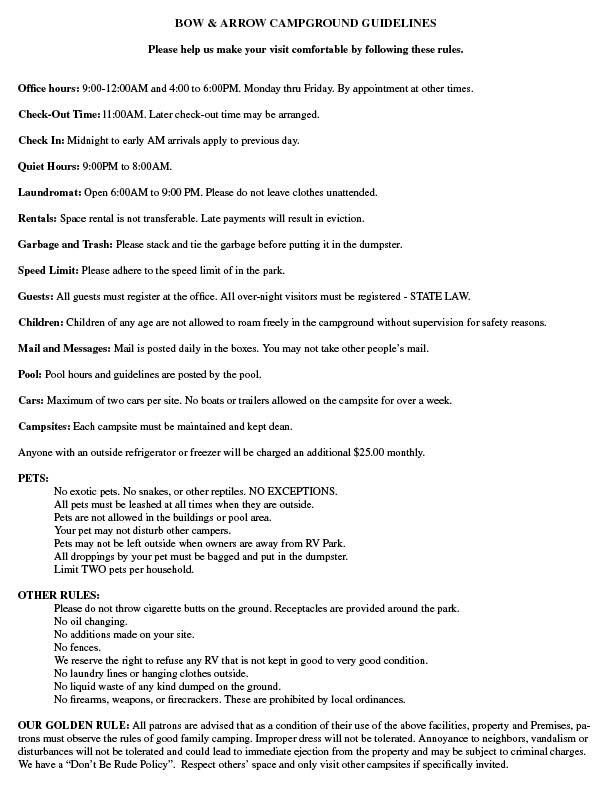 No appliances are allowed outside of camping units. There will be no additions made on your site, such as landscaping, gardens, decks, tents, outbuildings, etc., without the prior permission from the owner. Rent will be automatically increased by $25 per month for any RV with more than one air conditioner, washer, dryer, etc. ; that puts more strain on the existing service; that requires 220-50 AMP service; or that increases the monthly usage allotment. All garbage must be in plastic bags and tied securely before it is put in the dumpster. This includes droppings by your pets. If your dumpster is full, please carry your garbage to another dumpster in the park. Do not leave garbage outside of dumpster or overload it so that the lids do not close. There are three dumpsters on the premises and pickup is on Wednesdays. Click here to download and print the guidelines for your reference.